UPDATE: This party was also chosen for an Amy Atlas feature here. Hooray! 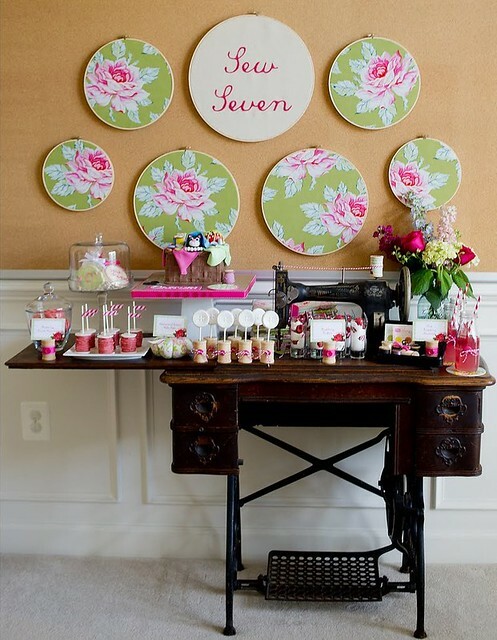 I'm honored to have 2 treats of mine (spool-shaped cake pops and raspberry French macarons) featured today over on Christine's Pure Joy Events as part of the amazing Vintage Sewing Party she created for her daughter's birthday. Please stop by her blog to get all the lovely details, and look out for a tutorial to come soon showing you how to create your own Spools of Thread Cake Pops! Those spool cake pops are fabulous! what a lovely display. this is beautifull!!! 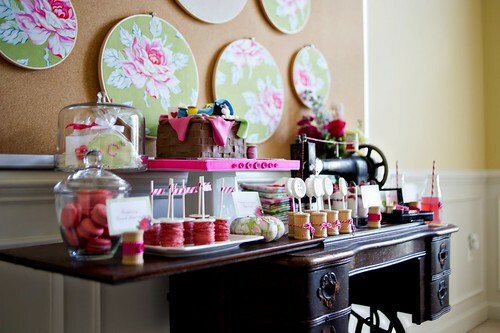 i have that table... and the sewing machine too! Wow-gorgeous! What a fun party! Oh, we had one of those in the old house ... the sewing machine, I mean. I wonder where it went? Hope some relative inherited it. Such a pretty, pretty set up! And those cake pops are amazing! Love the vintage sewing machine and the color scheme. My mother gave hers away not long ago and I felt the pain! That's sooo lovely! I'd loove to be there! Looks like you guys had fun! This is really fantastic. Creativity at its best. Hi Xiaolu! I´ve just known about your blog and I´ve to tell you that it´s beautiful. I really like it and I will follow it from this very moment. i always contemplated on doing a craft blog instead of a food blog b/c i love crafts. but now i'm glad i'm doing food b/c Christine is completely out of my league. what an amazing party and the treats look awesome. looking fw to the spool pops too! ps - if you are interested in sewing for beginners, check out Sublime Stitching. i bought a kit and i love it!! Can't wait for the tutorial. Incredible cake pops! What a beautiful setup! How nice that you could take part. I'm sure your contributions were delish. Oh man, such prettiness (is that a word?). Would LOVE to have a party like that, but I'm not sure I could pull it off as brilliantly as you! oh my gosh! this is sooo fabulous!